The Skeleton pane can be accessed under the View tab in Motive or by clicking icon on the main toolbar. 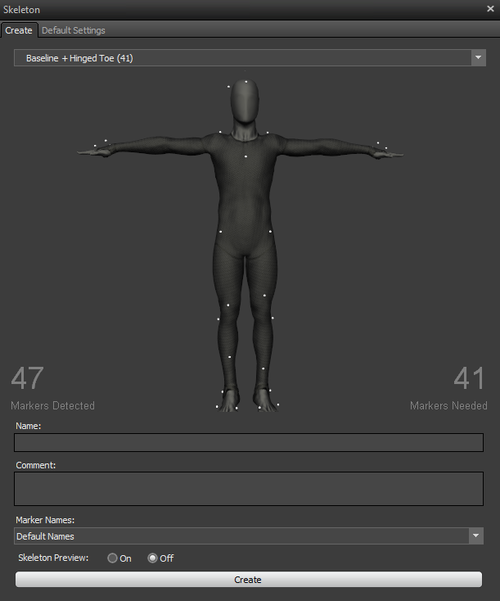 For more information on the skeleton asset creation workflow, read through the Skeleton Tracking page. Choose Markerset: Selects one of a number of predefined marker sets for use. The dropdown choices display the name of the marker set, which describes which portions of the body that markerset will track (e.g. toes, fingers) and the total number of markers included in the markerset. Markerset Placement Guide: A 3D guide demonstrating how to place markers on your subject. The guide can be rotated by right clicking and dragging, translated by holding the scroll wheel down and dragging, and zoomed using the scroll wheel. Markers Detected: The total number of markers detected. If no markers are selected in the 3D Perspective View, this number will show the total number of markers found in the volume. If markers are selected in the 3D Perspective View, the total number of selected markers will be displayed. 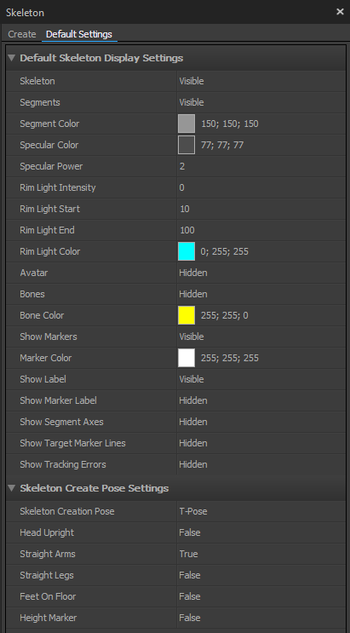 Markers Needed: The total number of markers needed to create the skeleton (varies based on which markerset is selected). Name: Defines the name of your subject’s skeleton asset. Naming the skeleton so that it can be easily referenced in post is recommended. Comment: A field to store notes on the skeleton asset. Marker Names: Applies default or custom marker labels to created skeletons. A XML file with marker labels in each row must be imported in order to auto-label skeleton markers with custom labels. Skeleton Preview: Provides a preview of the skeleton that will be generated upon selecting “Create,” without actually committing to the skeleton creation. It’s useful to have the subject form a T-pose to trigger the preview. Create: Creates the skeleton model from the selected (or all visible) markers. Pressing this when Markers Detected and Markers Needed are not the same value will result in an error message explaining why the skeleton cannot be created, and red highlighting of the problematic markers in the Position Preview. Default skeleton properties are applied to only skeletons that are newly created after the properties have been modified. Asset specific skeleton settings are modified from the Project Pane. Skeleton: Toggle between visible and hidden to change visibility of a newly created skeleton. Segments: Toggle between visible and hidden to change visibility of skeleton segments from a newly created skeleton. Segment Color: Set the skeleton segment color for a newly created skeleton. Specular Color: Set the skeleton specular color for a newly created skeleton. Specular Power: Sets the intensity of specular colors on a newly created skeleton. Rim Light Intensity: Controls the strength of the glowing edge effect of the skeleton model. Rim Light Start: Sets the starting range for skeleton rim lights. Rim Light End: Sets the ending range for skeleton rim lights. Rim Light Color: Sets the color for skeleton rim lights. Avatar: Show or hide an avatar for the skeleton. Bones: Show or hide skeleton bones. Show Label: Shows skeleton label. Show Segment Axes: Displays orientation axes of each segments in the skeleton. Show Target Marker Lines: Displays a line between actual markers and related expected marker locations. Show Tracking Errors: Changes color of skeleton segments with errors. Head Upright: Creates the skeleton with heads upright irrespective of head marker locations. Straight Arms: Creates the skeleton with arms straight even when arm markers are not straight. Straight Legs: Creates the skeleton with straight knee joints even when leg markers are not straight. Feet On Floor: Creates the skeleton with feet planted on the ground level. Height Marker: Force the solver so that the height of the created skeleton aligns with the top head marker. This page was last modified on 20 January 2017, at 12:48.